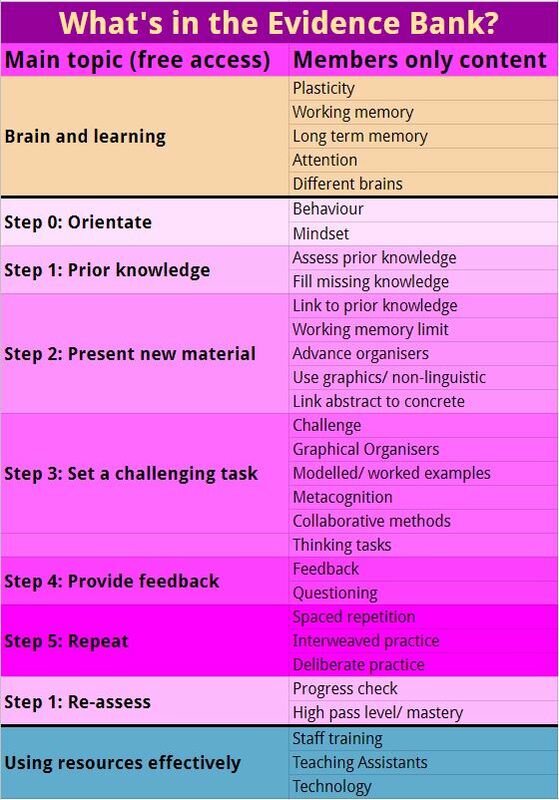 The evidence shows that there is a process by which learning happens. This means that all students can learn. When our students fail, it is because they have not gone through this process. We call this process the ‘learning cycle’; it has 6-steps. What do you get if you join the Evidence Bank? The table shows the pages which are visible to everyone on the left and the ‘members only’ pages on the right. What’s in the ‘main topic’ pages? These pages give you a brief overview of the topic and what you will find in the ‘members only’ pages. What’s in the ‘members only’ pages?